Everyone loves a uniquely designed store. It makes for a great conversation starter with friends and also a cool picture hangout spot for the gram. The amazing thing about greatly designed retail stores is that word spreads around fast no matter how remote your store or showroom may be. New businesses or companies tend to bootstrap when starting out because of the financial implications involved in hiring a pro. However, whether it’s a fashion store, betting shop, shopping mall, supermarket or departmental store, every retail store needs its space to tell its vision in such a way that it drives revenue growth. Most businesses would opt for DIY approach and get it wrong, that’s why it’s best to get a professional who can handle the job really well. From the moment, someone steps into your store to the time they decide to check out, smart design decisions make a huge difference in whether you make a sale or not. 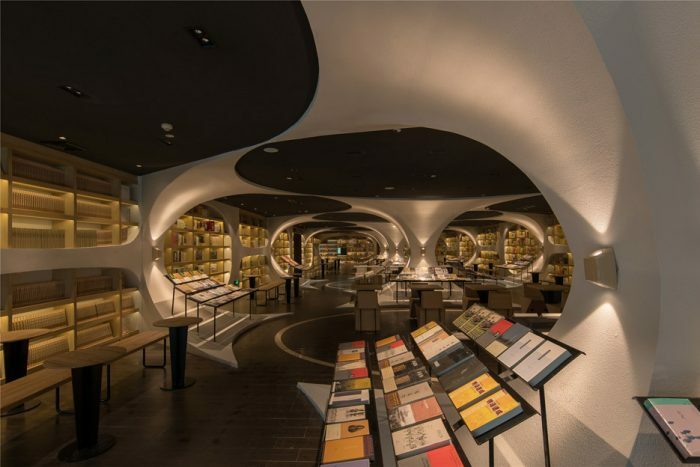 Who wouldn’t want to shop in this bookstore? Good aesthetics transcends language. As earlier mentioned, a great looking space has mass appeal. When you walk into a room with an exceptional design, you are bound to share your discovery with friends. With little or no advertisement, a business could smash its revenue goals in a month just by employing an interior designer to redesign and create a stand-out theme for its space. The more people visit, the more the word spreads about your services. The devil is in the details. Fusing the 7 elements of interior design which are space, line, form, light, colour, texture and pattern, to speak to the heart of the customer. The job of interior design should be handled by a professional — an interior designer has the right expertise to create a look that will influence the customer to part with their cash in return for your product or service offering. Uniqueness appeals to the customer. With lots of brands and products fighting for customers attention daily, making your brand stand out from the crowd is very important; through exploring creative interpretations while placing the product at the heart of the display and effective use of space. Brands can grab the attention, communicate a message, tell a story and positively reinforce their offerings in the mind of the customer. Infusing colour palettes and intimately aesthetic styles that align with your company theme creates a look that resonates with your clients. Certain colours will be properly attributed to your brand anywhere it is seen. This would register in the customer’s subconscious and remind them of the existence of your brand at every point in time. The interior designer specializes in the design and construction of retail spaces, combining a wide range of creative and technical skills. They know the types of visual branding you envision and know how best to translate it into your business space. High-end restaurants have been able to key into the impact of great interior design in Nigeria. Other retail outlets in various industries still need to leverage on this trend as well for growth. The benefits as mentioned above are huge and cut across free publicity in the media to getting your brand name on everyone’s lips. If you have no other reason to get your interior designer to level up the look of your retail space. At least, do it to make more sales. Are Interior Designers only for the wealthy people?